(Hawthorn, Snowy Mespilus, Hawthorn, Quince tree, Medlar, Pear tree, Apple tree, Rowan). This family is characterised by fleshy fruits, with skin and calyx (shriveled remains of the sepals, style and stamens of the flower), containing pips (which are seeds). 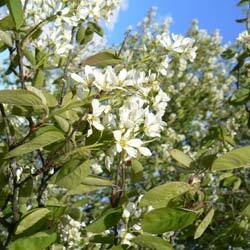 Etymology: the name " Amelanchier " is a Provençal word. Species: the Snowy Mespilus of Canada, Snowy Mespilus canadensis, is a tree reaching 20 m, while the Provençal is a shrub. Habitat: Snowy Mespilus does well in a good deep soil. It fears limestones. It prefers sunshine and heat. Hardiness: zone 5 (it supports cold until -29 °C or -20 °F ). The Snowy Mespilus of Canada is even more hardy: zone 4 (-35 °C or -31 °F). Blackish smooth bark. Slender stems sparsely leafy. Deciduous foliage. Leaves (3 - 6 cm) almost ovoid to ovate, cordate at the base, finely toothed, dark green on the top, whitish hairiness on the underside. They are copper-coloured red in the bud, and again red in autumn. White flowers with 5 petals spaced out, in often vertical clusters, from April, before leaves appearance. Red fruit, possibly becoming dark blue, protruding (D 1 cm). Fruits are very appreciated by birds. 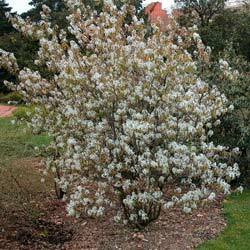 Use: ornamental, very hardy shrub. Of its fruit, it is possible to make some jam or some jelly.